Benedicta McCarthy, 25, said she believes she would not be alive today if not for countless prayers to her namesake, Sister Teresa Benedicta of the Cross. "I've been ... really blessed with ... a lot of things I felt were miracles," McCarthy, the product of a devout Catholic family in Brockton, Mass., said. While McCarthy's parents were out of town in 1987 when the family was fighting the flu, the oldest children were left in charge. McCarthy, the youngest of 12, got into the medicine box and swallowed enough Tylenol to land her in the emergency room. Having accidentally ingested 19 times the lethal dose of acetaminophen, the 2-year-old lay near death from total kidney failure and a deteriorating liver. Doctors predicted she would die. Desperate for divine intervention, the McCarthy family organized prayer chains, asking anyone they knew to pray specifically to Benedicta, who had been dead for more than 40 years. McCarthy was named after the German nun, who was born Edith Stein, to a Jewish family and found the Catholic faith in her 20s. Stein eventually joined the Carmelite order of nuns in 1933 when Adolf Hitler's regime took over Germany. She was killed at Auschwitz in 1942 and is said to have gone to her death forgiving her persecutors. When their baby was in intensive care and at the top of the liver transplant list 23 years ago, she said, McCarthy family members believed their prayers to Benedicta were heard immediately. "I started to move my toes and ...[doctors] just did a bunch of tests and lab work and everything came back normal," she said. "Like there was no gradual recovery. When they looked back at the doctors' notes, one of the doctors that had seen me that morning had wrote in the notes, this child has made a remarkable recovery." McCarthy's father, Charlie, said it was a miracle. "I remember very explicitly when Benedicta walked out of Massachusetts General Hospital at 2 years old without an ounce of medication," her father said. "With a balloon, she walked to the elevator, pressed the button herself, and all I could think of is, 'There goes the glory of God.'" The case was sent to the Vatican, who then authorized a rigorous investigation to determine whether McCarthy's healing was indeed miraculous. In the course of three years, anyone with any knowledge of the events was interviewed in exhaustive detail. McCarthy's older siblings were quizzed down to the minute details of exactly what kind of Tylenol their youngest sister ingested. The family was also questioned about to whom they directed their prayers. "That was the big thing, that we had all prayed to Edith Stein," older brother Charles said. "And that my parents had asked people. And, also, that my parents had told us to tell others to pray to Edith Stein." Sworn testimony was also taken from experts in liver damage and child poisoning. Doctors who had overseen the case were also questioned, including Dr. Ronald E. Kleinman. "The questions were very pointed and very direct," Kleinman said. "I think they really wanted to know what happens to children who do get an excessive amount of acetaminophen. Do children usually die from this kind of poisoning? Was this an extraordinary case?" Then, a 900-page document was bound, notarized and shipped to the Congregation for the Causes of Saints in Rome, the 400-year-old Vatican agency that determines who will be recommended to the pope for sainthood. The Vatican also confers with the Consulta Medica, a team of top doctors who meet at the Congregation for the Causes of Saints about 20 times a year. Here, the doctors scrutinize each case, searching for any possible scientific or medical explanation. Finally, each case must meet a rigorous test that determines whether the potential miracle was also instantaneous. McCarthy's near-death experience as a child was officially confirmed as miraculous by the Vatican. While the total number of Catholic saints is unknown, the Vatican estimates there are more than 7,000 saints to whom believers pray for help from beyond. Before his death five years ago this Friday, Pope John Paul II canonized almost 500 of them, more than all his modern predecessors combined. One of those saints was Sister Teresa Benedicta of the Cross. 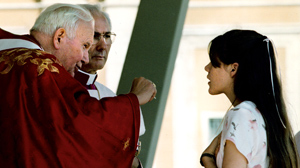 Then 14 years old, Benedicta McCarthy attended Benedicta's canonization Oct. 11, 1998. "It was really amazing and overwhelming," said McCarthy, who sat front and center at the ceremony with her family. "I felt really lucky at the time." McCarthy said she thinks of herself as an ordinary person who believes miracles happen every day. She said she hopes her story will bring peace to others who need faith in something many find unexplainable. "I feel really -- lucky that I'm here," she said, "[I] hope that it helped a lot of people."